After AT&T’s notice to the FCC that it is withdrawing its T-Mobile merger application, attention is now turning to AT&T’s alternatives for acquiring more spectrum. The FCC’s approval of the Qualcomm spectrum purchase puts the focus squarely on DISH’s 700MHz E block holdings, which would bring the Qualcomm spectrum up to a national 12MHz unpaired block. However, AT&T also needs a separate clean block of paired spectrum to implement its planned Carrier Aggregation Technology (as part of an LTE Advanced network). The original intention was to use AT&T’s AWS-1 spectrum holdings for this purpose, but AT&T would be required to give up the majority of its AWS-1 holdings (1.5B MHzPOPs out of ~2.5B MHzPOPs) as part of the break fee for the TMO merger agreement. As a result, AT&T will also now have to look for another clean block of spectrum away from the 700MHz band to enable deployment of the Qualcomm spectrum. Though this could in theory be done in the 850MHz band, it may be hard for AT&T to put together enough clean contiguous spectrum (2x10MHz?) for a near term LTE Advanced deployment, especially if the FCC’s conditions on the Qualcomm purchase mandate a rapid buildout of the spectrum. In this context I think a much bigger deal with DISH is the only logical outcome, and that will mean either a companion purchase of DISH’s 2GHz spectrum holdings (DBSD/TerreStar) or even a takeover of DISH itself (which could complement AT&T’s U-verse service and satisfy Randall Stephenson’s ambitions to complete a major deal). Though getting FCC approval for an ATC waiver would have to be finessed (probably by offering the government some compensation for the step-up in value), this would allow the DBSD and TerreStar spectrum to be brought into use more quickly. Indeed, by designating the AT&T/TMO merger (as DISH requested), approving the Qualcomm spectrum transaction, and apparently supporting “the efficient use of spectrum without decreasing competition“, the FCC seems to be implying that this would be its preferred course of action for AT&T to take. The outcome for a jilted TMO would certainly be more challenging, but when the Justice Department has stated explicitly in its antitrust arguments that reducing the number of national wireless operators from 4 to 3 is unacceptable, a sale to Sprint also seems to be off the table. Of course that would be a good reason for AT&T to pursue the February court case to a conclusion, because a ruling against AT&T on these grounds would also prevent a future Sprint/TMO or Verizon/Sprint merger. Instead, a spinoff and float of TMOUSA, potentially with the cable companies injecting their AWS-1 spectrum in exchange for an equity stake in what would then be a listed company, could give TMOUSA a much stronger position with roughly 50MHz of AWS-1 spectrum (used for HSPA+ in the near term) and roaming rights onto AT&T’s network. That would leave Sprint as the Thanksgiving turkey, with no good spectrum options other than to do some form of deal with Clearwire. Ironically, with Sprint having agreed with DISH just a few weeks ago to withdraw its objections to the use of the DBSD/TerreStar spectrum, it may be hard pressed to credibly object to a deal between DISH and AT&T. Unfortunately for Sprint, it also seems that Clearwire may have increased the amount of funding it is asking Sprint to provide in the near term (as an advance against an extended capacity purchase agreement), because it is proving harder than expected for Clearwire to raise money from others (e.g. vendor financing). Whether that will be acceptable to Sprint, in an environment where it faces severe cash pressures to execute its Network Vision strategy, is unclear. It will therefore be very interesting to see what happens next Friday, when Clearwire’s interest payment is due. Buried in the LightSquared FOIA disclosures is another very interesting (and hitherto unreported) story of Sprint’s plans to host the public safety D-block buildout, via a network sharing agreement based on the terms agreed with LightSquared. I highlighted back in June that it was strange of Sprint to mention hosting public safety (but not LightSquared) at the May 12 New America Foundation event. However, it appears that Sprint had been working in concert with the White House for several months to promote this concept, and had strong backing for this approach from Aneesh Chopra, the United States Chief Technology Officer, as recently as mid-September 2011. Indeed it seems that a potential D-block opportunity may have been one of the items that Sprint hoped to highlight during its disastrous October 7 investor conference, but as far as I’m aware the government has not yet released the RFI on potential partnerships mentioned in the September discussion. A hosting deal may ultimately be another source of revenues for Network Vision, if the government can act soon enough on the D-block, but of course in the current political climate that is far from a foregone conclusion. In the meantime it appears that Sprint is trying to avoid providing additional funding to Clearwire, in the hope that Clearwire will be able to meet its near term cash needs from other sources. Judging by Clearwire’s threat to not make its upcoming bond interest payment, it seems that may not be possible without an increased (and upfront) payment from Sprint. Thus, the outcome may ultimately be determined by who has the greatest amount of leverage in this negotiation. In particular, one critical factor may be whether Sprint believes Clearwire could play the @Home card, and threaten to turn off 4G service to Sprint customers after a bankruptcy filing (which would be a PR and customer relations disaster for Sprint), instead of WiMAX service continuing without interruption as Sprint asserted on October 7. Of course, one thing that Sprint has proved time and again is that it is pretty poor at ending up on the winning side of a negotiated deal. However, it seems to be pretty poor at understanding the consequences of its actions as well, which makes it hard to predict where this will end up. Let’s ignore the federal government! Astonishingly, that is actually what LightSquared told the FCC last week in an ex parte meeting where “LightSquared representatives made clear that any determination that the federal precision and timing coexistence issue has been resolved would have to be based on objective and independent test results and not the subjective views of the federal agencies involved”. Of course the entire process hangs on the “views of the federal agencies involved” and if the DoD, FAA, etc. say this can’t happen then it won’t happen. Clearly LightSquared understands only too well that the entire federal government now views the company about as favorably as an envelope full of anthrax, but can LightSquared seriously intend to argue that its own “independent” testing is good enough and the government shouldn’t bother doing the rounds of additional tests that the PNT Executive Committee is expecting to start in the spring of 2012? In reality that sounds more like their opening argument in the upcoming litigation (“the FCC ignored the fact that we had tested all these solutions ourselves”) than a realistic way forward, and at this point in time, its hard to imagine LightSquared has anything to lose by waiting much longer to initiate that phase of its strategy. UPDATE: I understand that the reason for LightSquared’s comment is that they were told by the senior FCC staff in the meeting not to expect a ruling from the FCC anytime soon, because of the need for substantial further testing by the PNT Executive Committee, and there would certainly not be an announcement in December as LightSquared’s CEO was “guaranteeing” only a few weeks ago. The documents released by Citizens for Responsibility and Ethics in Washington (CREW) from the responses to their FOIA request to the White House’s Office of Science and Technology Policy (OSTP), don’t yet provide any smoking guns about the process by which LightSquared was able to get its FCC waiver in January 2011, after applying for it one year ago today. However, the information that is currently online represents only a tiny fraction of the 13,450 responsive documents supplied by OSTP, so it is hard to tell if there is anything more significant still to emerge. In my view, the most intriguing new document is the January 12 2011 draft of LightSquared’s commitment letter to the FCC, which states that the “industry working group comprised of participants in the telecom and GPS industries…should be lead (sic) by the Commission“, whereas in the final version of the letter this paragraph was removed (and LightSquared was ultimately appointed by the FCC to lead the Technical Working Group). This change seems to have been agreed to by the FCC in exchange for LightSquared stating that “we are willing to accept as a condition on a grant of our request the creation of a process to address interference concerns regarding GPS and, further, that this process must be completed to the FCC’s satisfaction before LightSquared commences offering commercial service”, a commitment which LightSquared’s counsel described as “an investment & customer killer”. Perhaps more significantly, the documents also provide a very interesting perspective on how views of LightSquared evolved within the FCC, White House and NTIA between mid 2010 and summer 2011. In July 2010, Jim Kohlenberger, Chief of Staff at the OSTP, thought LightSquared’s deal with NSN was “very exciting“, while in September 2010 he kept “hearing great things” about LightSquared. By January 2011 LightSquared’s relationship with the White House was sufficiently close that LightSquared’s counsel was asking “if there’s anything NTIA can do with the press on background to calm the waters” because “Press reports…are leading to big problems with investors, present & potential, customers, Sprint, et al”. Once this timeline and the current attitude of key people in government is understood, it becomes evident how truly dire LightSquared’s prospects are. Simply put, there is now no chance whatsoever that there will be any positive ruling from the FCC (or even an end to the testing, which can be prolonged almost indefinitely if the government insists on testing LightSquared devices as well – indeed the FAA presented a timeline yesterday with potentially multiple stages of further testing, including handsets, beginning in the Spring of 2012), and it is simply a question of wondering when the money all runs out. So apparently yesterday’s PNT Advisory Board meeting was “a watershed moment” for LightSquared, because “the GPS interference issue can be solved” and “the entire debate has turned from whether there is a solution to who pays for it”. Of course, that’s a massive oversimplification of reality, because as the introductory presentation to the meeting set forth, there are vast amounts of testing still to perform. In particular, the latest PNT newsletter has confirmed that LightSquared’s proposed solution for precision devices will not be tested until at least “early 2012″. However, what no-one seems to have picked up on is that in LightSquared’s semi-annual progress report, filed with the FCC on October 31, the company confirmed that it is ignoring the FCC mandated timeline (from the January 2011 waiver) to make devices available by September 30, 2011 and now has postponed the anticipated availability of “embedded modules, USB data modems and other devices” from BandRich and AnyData until “late 2012″. While LightSquared still expects Qualcomm to make chipsets available in “late 2011″ that could “facilitate access to LightSquared’s network” there is no associated commitment to actually make devices. Though Sharp and Airtouch “have agreed” to develop a range of devices, there is apparently no timeline for this to take place (indeed Sharp has stated publicly that it “would need a minimum purchase order before it would build such devices”). Basically, therefore it appears there will now be no devices capable of accessing LightSquared’s network for at least a year or more, making LightSquared’s continued assertions that it will launch service in the “second half of 2012″ even more laughable than they already were. 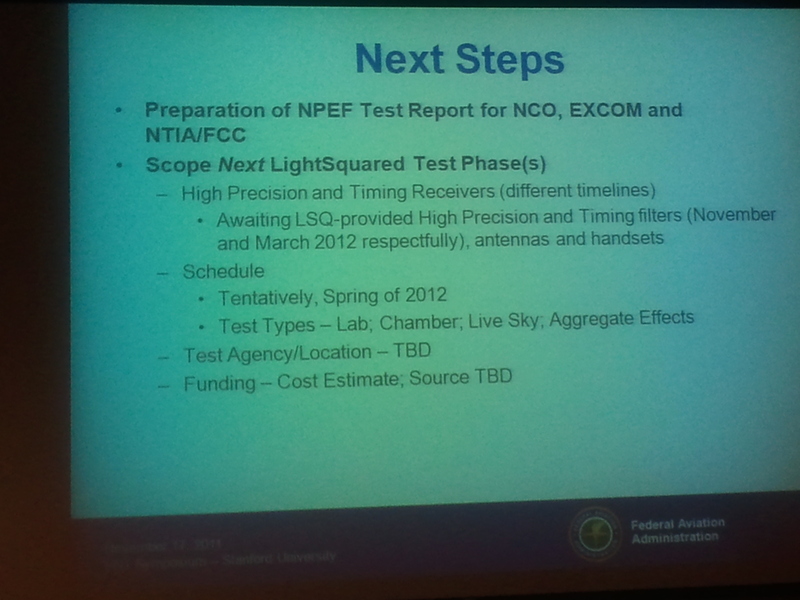 More importantly, if testing of LightSquared devices is also a pre-requisite for FCC approval, as the PNT Advisory Board apparently desires, then it now seems that this will not be possible for many months to come. Of course, this gives the FCC yet another excuse to hold off from making any ruling on the LightSquared issue, even to ban terrestrial deployment in the upper 10MHz band which everyone knows can never be used, because that will simply provide LightSquared with the excuse it is looking for to initiate litigation over the supposed expropriation of “part of LightSquared’s spectrum – worth billions of dollars”. In addition to Sprint’s announcement today that it plans to offer new debt in a private transaction, Sprint has more quietly been rounding up additional money from both LightSquared and DISH. In Sprint’s most recent 10-Q, filed yesterday, the company notes that “In September, the [spectrum hosting] arrangement was amended to change the September 30, 2011 contingency date for LightSquared’s performance to December 16, 2011. The December 31, 2011 contingency date remained unchanged. This amendment also provided for an additional prepayment of $20 million, which was received in October 2011.” Today, Sprint has told the FCC that “DISH and Sprint have today reached an agreement to settle all of these [reimbursement] disputes among Sprint, DISH, and their subsidiaries and affiliates in a mutually satisfactory manner” and will presumably therefore be paid a significant proportion of its $220M claim against DBSD and TerreStar ($110M per company) for BAS relocation expenses. UPDATE (11/7): DISH has now revealed that it will pay Sprint a total of $114M, though it is not yet clear if Sprint will retain any additional claims in the bankruptcy cases of DBSD and/or TerreStar Networks. However, the two disclosures appear to have rather different consequences for LightSquared and DISH. In the case of LightSquared, this represents another $20M of expenditure over and above the amount assumed in my analysis earlier this week. More importantly, Sprint has set a precedent under which it will now presumably expect to be paid even more money when LightSquared is unable to meet the revised deadline of December 16 and the second deadline of December 31 (and of course it is certain that the FCC will not be able to rule by then, because LightSquared’s proposed filter for precision GPS equipment is not being tested by the government this month, as LightSquared has now admitted). I also now suspect that Boeing’s vendor financing loan may simply have been extended (perhaps by 12 months? ), from its original December 2010 repayment deadline, and a new deadline is likely to occur relatively soon, because Boeing will need some certainty about whether the SkyTerra-2 satellite will be available for its MEXSAT project. If Boeing does insist on repayment (of what would now be $130M+) within the next few months, then (faced with the unpalatable alternative that LightSquared forfeits the ground spare satellite and potentially jeopardizes its ATC license) LightSquared could well run out of money before its next first lien interest payment in April. Specifically, my estimate on Monday was that LightSquared would have about $170M in cash at the end of Q1 2012, which would not be sufficient to cover a payment of $130M+ to Boeing, plus the $20M already paid to Sprint and the additional payments that are now likely in respect of the December deadlines. Even without making any repayment to Boeing, if LightSquared needs to pay Sprint an extra $20M for each additional 3 month deadline extension, then it would have barely enough money to make the interest payment due on April 1, 2012. While DISH argues that it took into account the possibility of future flexibility for the spectrum during the bankruptcy process, certainly other parties were not factoring that into the process. Moreover, 40 MHz of nationwide, terrestrial broadband spectrum would not be valued at $2.8 billion. When looking at past valuations for such spectrum assets, a valuation of 3 to 4 times this would be more realistic if terrestrial rights were guaranteed. Of course, that statement once again highlights the issue of LightSquared’s own $10B windfall problem which the GPS industry are now making so much of, and makes it harder for the FCC to grant DISH a waiver without some way to recover value for the Treasury. As a result, it is plausible that (with the transfer of control and ATC waiver being processed by the FCC in separate dockets) a ruling on the transfer of control could come ahead of any waiver decision. UPDATE (11/14): A November 9 ex parte filing from DISH appears to confirm that the FCC is concerned about the “windfall” issue and might separate the transfer of control ruling from the waiver requests.